This is an ode to a canoe. A year ago today, on July 14th 2015, I abandoned my canoe in the James River at the base of the Fall Zone’s last rapid in downtown Richmond. The canoe was partially submerged and unceremoniously folded around a granitic outcrop. 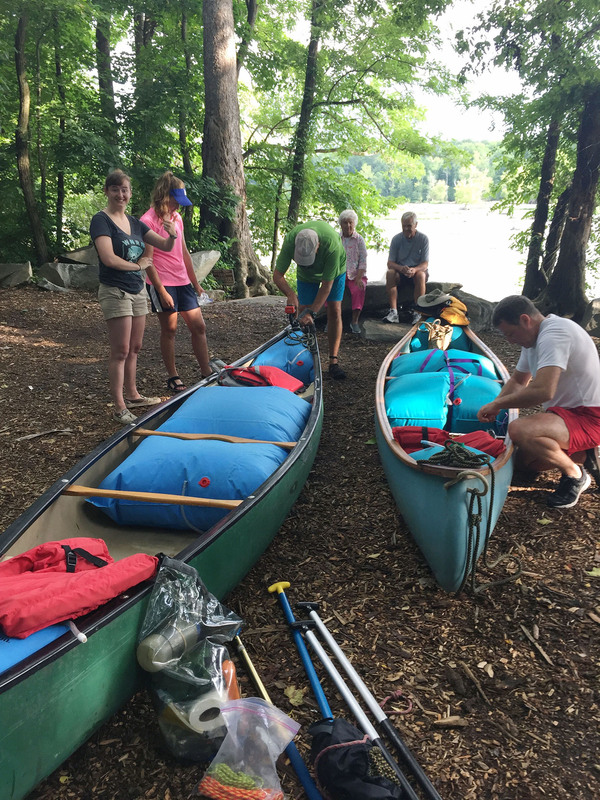 We were 180-km into a 300-km paddle trip from the Blue Ridge foothills to Williamsburg. 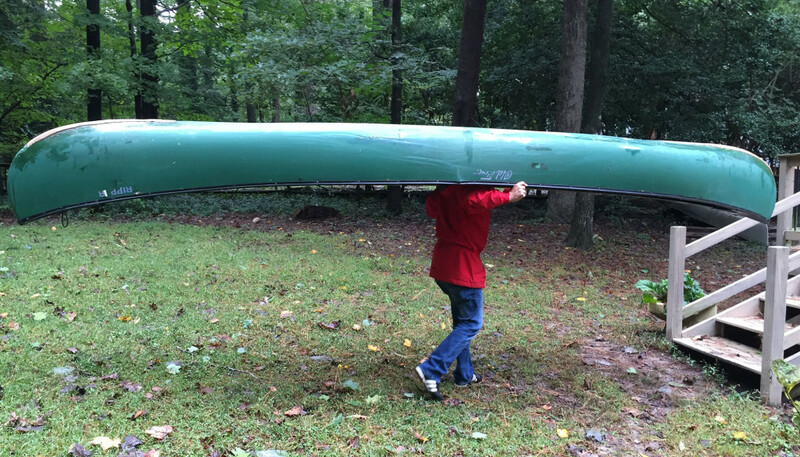 Fortunately, we located a replacement canoe and paddled onward – completing our journey to Williamsburg two days later. Soon after the trip I returned to the rapids, hoping that at lower water levels the canoe would be recoverable, but to my chagrin the canoe was gone. Not only had I broken my canoe, but now it was lost. It was a green Old Town canoe, a 17-foot long Tripper (that’s the model) designed for wilderness trips – it’s a boat that can handle whitewater and also carry a heavy load. I purchased the new canoe in 1992 for $600 (no small expense for a graduate student), and it’d spent more than two decades on Appalachian rivers. I loved that battered old canoe − over the years the Tripper and I had descended countless rapids, paddled across wide expanses of flat water, and enjoyed many research trips together. Now the canoe was gone, and I’d lost an old friend. It was over a month later, and I was still grieving, when I received a text message from my former research student Kelsey Watson that read – “I have located the canoe”. A picture soon followed. The Tripper was safe and dry in a Richmond backyard. The Tripper safe and dry in a Richmond backyard! The dry bags (the blue lumps) did not fair as well. Kelsey, a Richmond native, was in the Tripper on that fateful day. 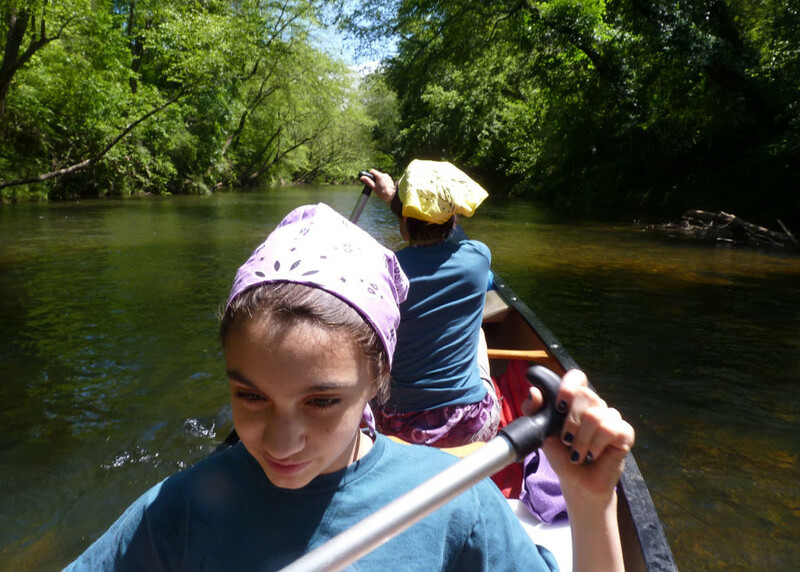 We’d both gotten flushed out of the canoe as it rolled into the last rock. It turns out that Kelsey had been visiting a former high school teacher (Michael Stratton) and recounted our sad story from the Fall Zone. Michael finished the story reporting that he and his friends (a merry band of kayakers) had pulled the Tripper out of the James River just hours after our mishap. Wow! Richmond is no tiny burg, what are the chances that Kelsey’s former teacher and his good time buddies would be the ones to save my canoe? It was a big job to extract the folded canoe from its watery trap. We spent 45 minutes trying to pry the canoe off the rocks, but we lacked a proper pulley or winch system, and eventually gave up our futile efforts. 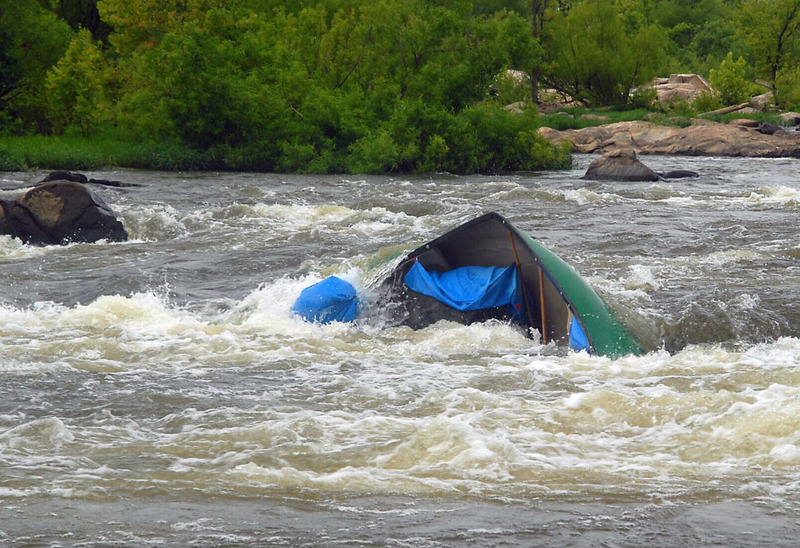 From the photo of the trapped Tripper it looks as though about 2/3rds of the canoe’s surface area was below the waterline and getting pounded by the waters of the James which were flowing at a brisk rate of ~3 meters per second. Let’s estimate the pressure acting on the canoe. To lever the boat out of the river nearly a metric force ton needed to be applied. The Tripper’s rescuers reported that it took considerable effort to free the boat. As a structural geologist I study deformed rocks – the canoe, jammed against a rock at the base of Pipeline Rapids, was most certainly deformed. The boat was folded, the bow and stern ends of the canoe, usually 180˚ apart, now had an interlimb angle of ~100˚. Simplified images of the undeformed and deformed state of the canoe. 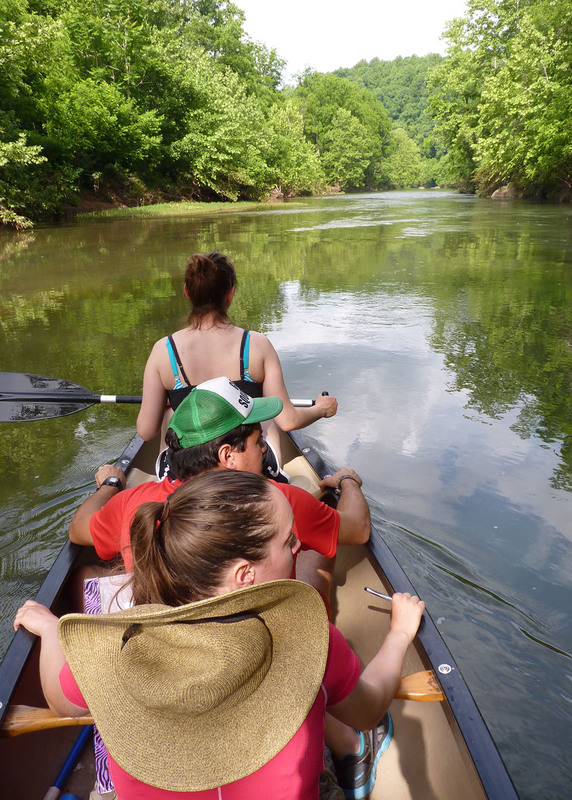 The onrushing James River produced enough stress (pressure) to strain (deform) the canoe. 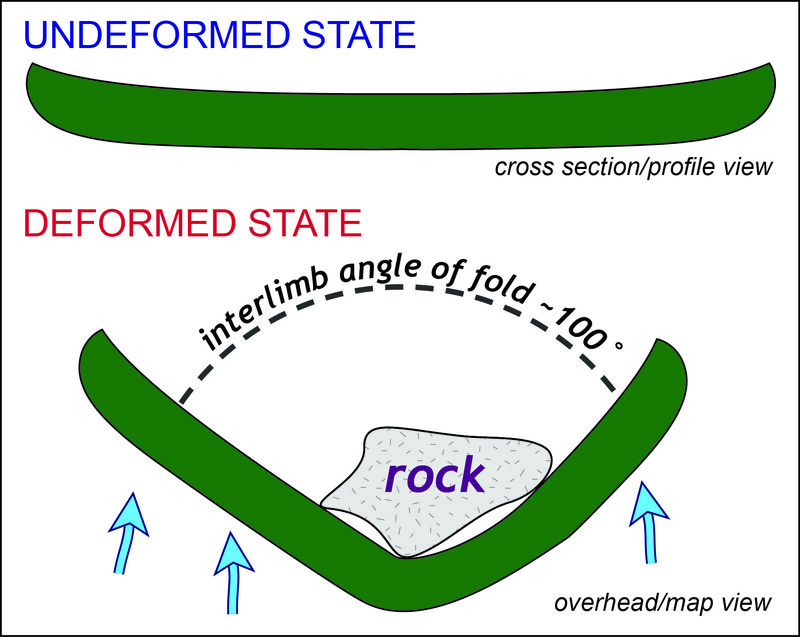 Folding is an example of ductile deformation, where a material changes its shape, but never looses its cohesion and fractures (brittle deformation). Had the Tripper been made of wood or fiberglass it would have shattered into pieces as the James River forced the boat into and around the rock. 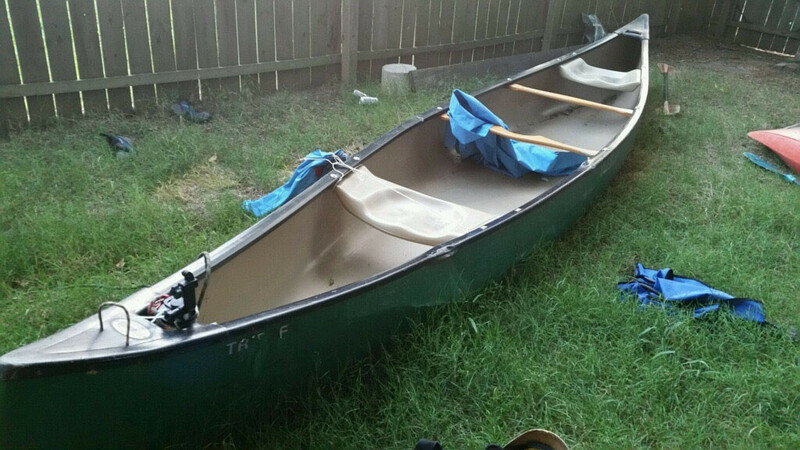 However, the canoe looked permanently deformed as the boat was still bent when the stress was removed (i.e. after the boat had been hauled out of the water). A deformed and folded canoe is not particularly useful. 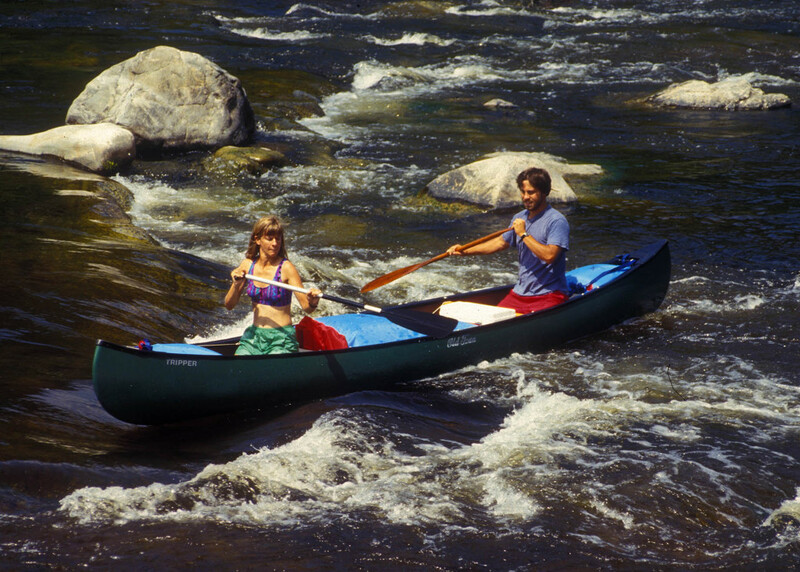 The canoe is made of Royalex, a trade name for a composite material, with an outer layer of vinyl and acrylonitrile butadiene styrene plastic (ABS) with an inner layer of ABS foam. Royalex is tough, and has some amazing properties. It has a ‘structural memory’ such that with a counter force applied a deformed Royalex canoe can be ‘popped’ back into shape. Indeed, with some effort the Tripper was popped back into nearly its original shape. There are spots on the hard plastic gunwales that remain crimped and the wooden thwarts aren’t quite orthogonal as they were before the incident. As one friend noted – the Tripper looks like it had a broken nose that never quite healed perfectly! The battered old Tripper comes home! This story has a happy ending. I was reunited with the old Tripper last Fall, it came home to Williamsburg, and this summer the canoe has once again plied the waters of the James on research trips. One of my research students recently told me that nobody actually reads my blog posts, but that people enjoy looking at the pictures. So I’ll finish this ode to my battered canoe with a gallery of photos. 1994 – First known photo of the Tripper, near Balcony Falls on the James River. 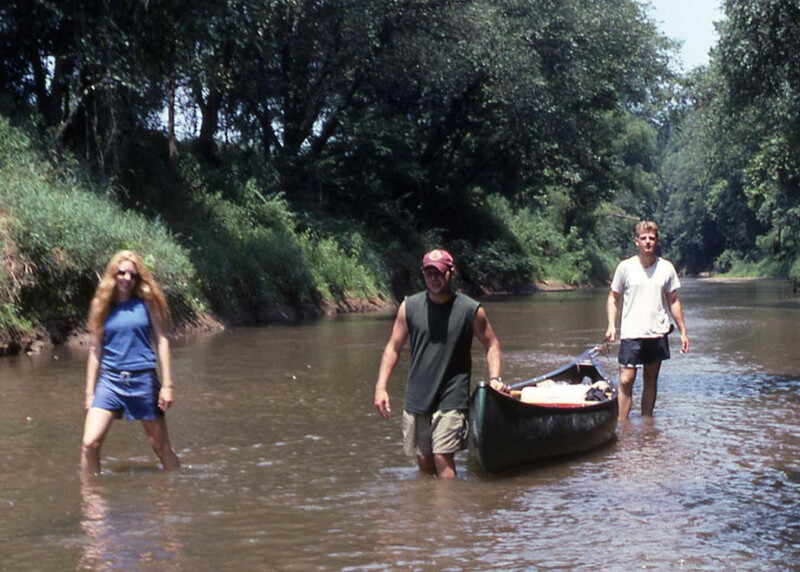 1998 – Research trip on the Robinson River in north-central Virginia. The William & Mary geologists are (from left to right) Lorrie Coiner ’99, Ashley Griffith ’99, and Scott Giorgis ’97. 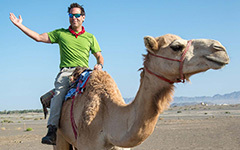 These days Lorrie is a geologist with the Virginia Department of Geology and Mineral Resources, Ashley a geology professor at the University of Texas-Arlington, and Scott Giorgis a geology professor at SUNY-Geneseo. 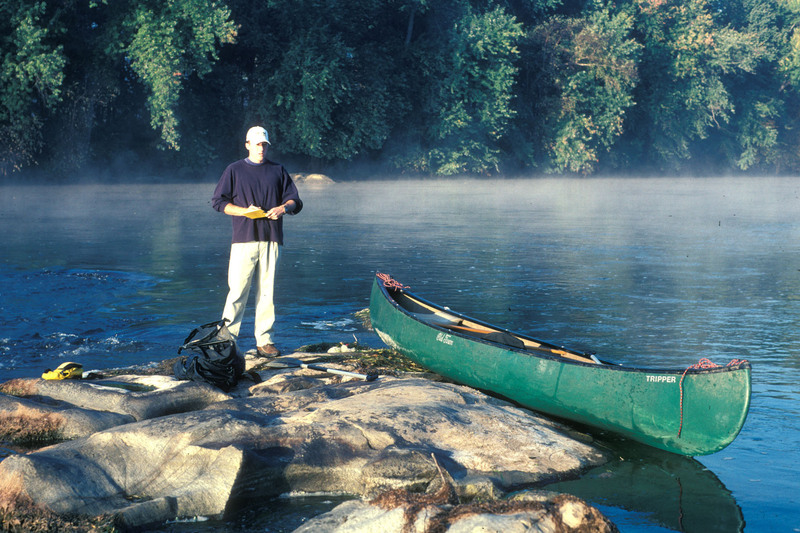 2000 – Research trip on the James River. Matt Goodman ’01 taking notes on the late Ordovician Columbia granodioritic gneiss outcrop in mid-channel. 2013 – Fun trip on the North Anna River. Sofia Mendez and Jennifer Bickham Mendez paddling towards the takeout. 2014 – Research trip on the Rockfish River with the Buckmarlson Banshees. From the bow sternward the Banshees include: Anna Spears ’15, Patrick Frier ’14, and Ciara Mills ’15. Gearing up at the Pony Pasture boat launch on the fateful morning of July 14th 2015. “What are the chances that Kelsey’s former teacher and his good time buddies would be the ones to save my canoe?” Sounds like an invitation to do some math, Chuck! I had to make some assumptions here: the “merry band of friends” was 5 people, people are present in the pipeline for an average 7 hours a day (based on the size of the parking lot and when people tend to kayak in summer), and I gave the canoe 24 hours to be rescued by before it gets swept beyond Richmond. Similarly, we’ll consider the population to be the city of Richmond, which has a population of 214,144 people (2013, US Census Bureau). Then, all we need to do is find the probability that someone finds the canoe in time [P(C)], and that that same person is one of the five friends [P(F)]; i.e. P(C&F) = P(C) x P(F)! Since P(C) = 7/24 and P(F) = 5/214144, the estimate I come up with is 0.000681%. Pretty incredible…but not zero! That’s what I love about probability…even super unlikely things CAN still happen!! If anyone has a better way of attacking this problem, or perhaps more accurate estimates for some of the values, I’d love to hear about it! Kelsey has more friends, for sure. I like what you did with the math, the multiplier is always fun as it makes two fractions, even smaller. The Tripper is loader on the 4Runner for another research trip tomorrow.